The Montessori method respects the innate drive in each child that guides him/her to instinctively take hold of what he/she needs most to learn at that given moment. Maria Montessori discovered that if allowed to indulge this sensitive period, the child learns with greater enthusiasm and thoroughness. 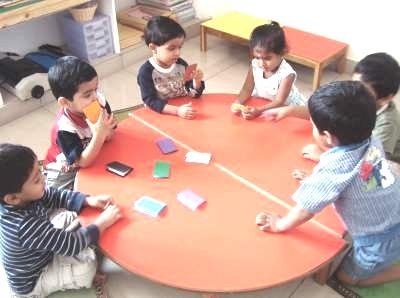 This unique feature of the Montessori school cannot be overstated – where by each child is given the freedom to choose his activities as best benefits his or her natural curiosity and corresponding to the special needs of his or her sensitive period of inner growth. The special art of the adults is to respect each child’s unique path of learning and growth, at the same time inspiring them to take in hand enough materials and activities that will provide the rich experiences necessary to form a balanced individual. The Montessori movement is not a narrow method of teaching but a broad philosophy of life. Every child possesses an inner force that drives him to grow and learn, we respect, observe, and provide an environment in which he can develop and learn. Education has a fundamental role in the formation of man, and its foremost aim should be to offer adequate aid and stimulation to the intricate process of inner constriction. So, the Montessori Directress finds way to reach the deeper layers of the personality permitting the dispositions to come into play. The ‘prepared environments’ and the role of the adult in the classroom are the main features which distinguish Montessori from other approaches in education.